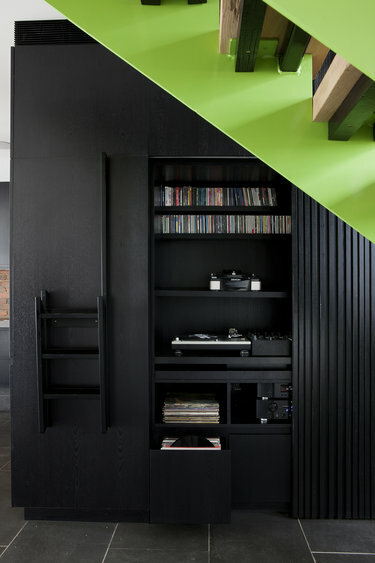 I’ll admit, black wouldn’t be the first colour I’d choose when designing a kitchen. 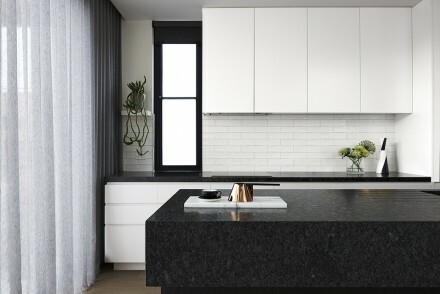 This isn’t to say that I can’t appreciate black kitchens – I even wrote a post on the subject on Copperline on Tumblr, where I swooned over a variety of sleek designs. My first choice would be a chalky grey hue, but every so often a black kitchen crops up on Pinterest or Tumblr, or on another blog, and it stops me in my tracks. This kitchen offered one of those moments. If you asked me to describe my perfect black kitchen, I reckon this would be it. 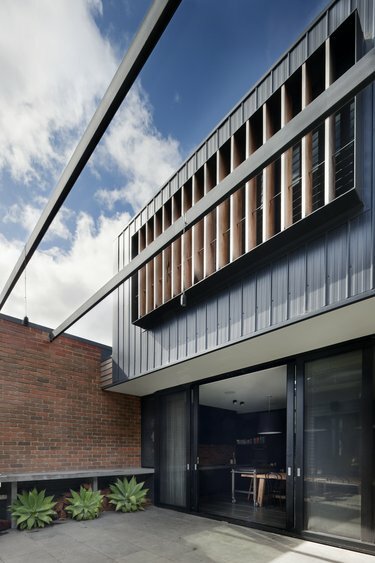 The Bridge Street project is the renovation and extension of a single-fronted Victorian terraced house located in Victoria, Australia, which was shortlisted in the Australian Interior Design Awards in the Residential Category for 2013. 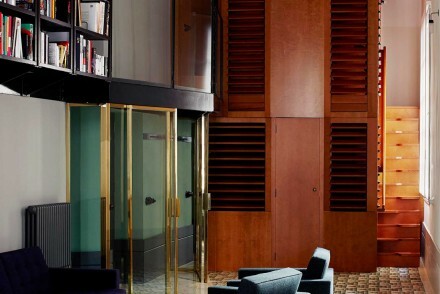 The project is the work of the St Kilda-based Beatrix Rowe Interior Design. 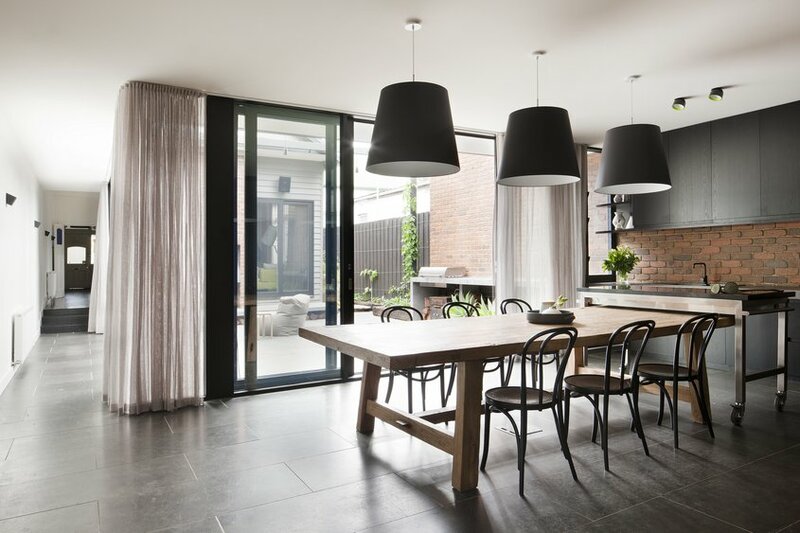 The new and the old parts of the house are separated by a large internal courtyard, and the dining-kitchen spills into this area thanks to large sliding doors that open up the courtyard elevation. The kitchen itself is super-minimal. There’s no extraneous detail here, with sleek handle-less cabinets and integrated appliances. Everything is tucked away, encouraging your eye to focus instead on the materials. I love the way the rustic timber table slides underneath the island/worktop unit, which is on castors. 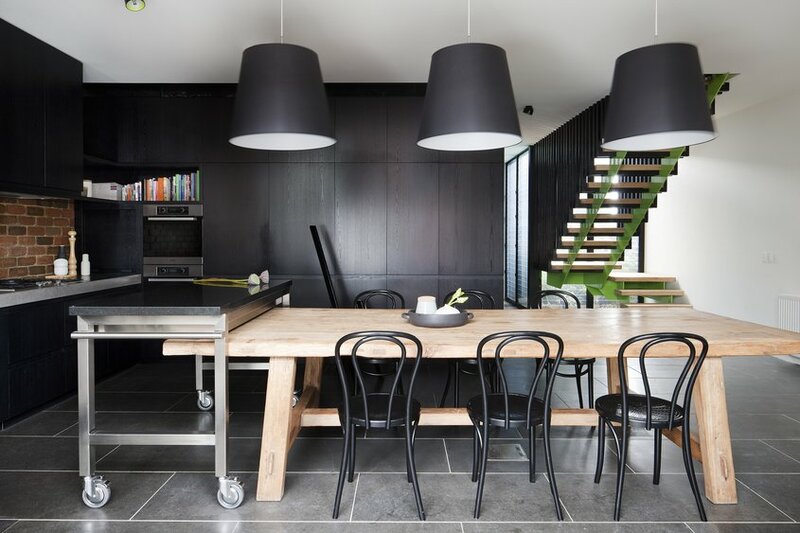 I like the scale of the pendant lights, and those Thonet chairs are such a cool classic to add to this space. And, most of all, I love the brick wall. 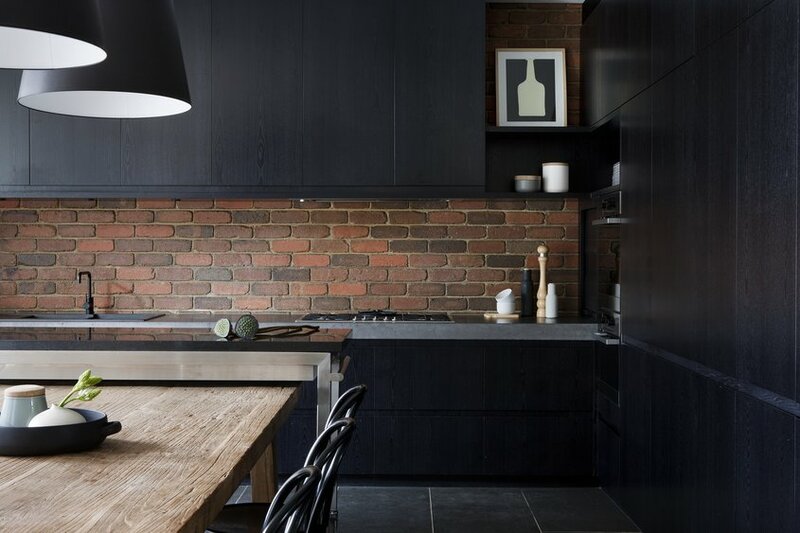 A splashback is a great place to add an interesting texture – I’m currently crushing on Carrara marble used as a worktop and splashback – but here the rugged quality of the brick is a perfect foil for the clean-lined cabinetry while its warm hue offsets the black beautifully. 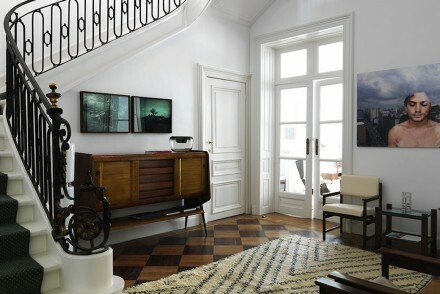 The living room is found on the opposite side of the courtyard, and while the palette here is much lighter and brighter, the black floorboards offer a visual connection to the kitchen, enhancing the flow between the two sides of the house. 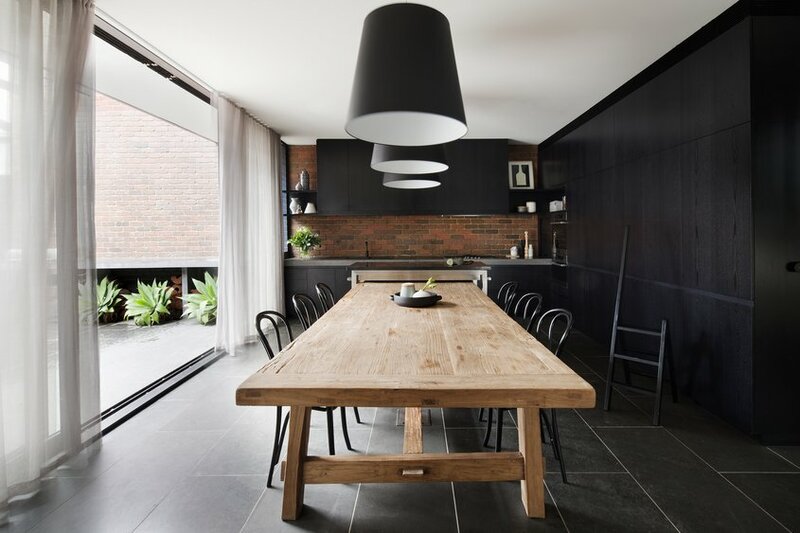 What do you think – does this combination of black and brick work for you? 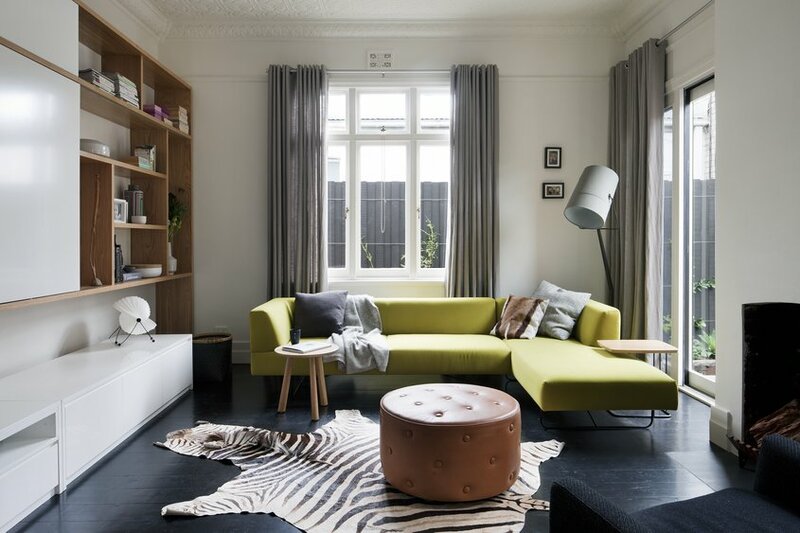 Photography by Shannon McGrath, as featured on Australian Interior Design Awards.